i have no idea why i rarely put my own tips into play. every time i go to a particular thrift store for clothes, i never have my measuring tape. this particular store does not have a dressing room and often the jacket of a suit may fit, but the pants are right tight and i cant do anything with it. if i had my measuring tape i could easily measure the waist and the inseam and make a decision of whether i can wear it or not. women don't really have an issue with no dressing rooms as they can wear spandex and try clothes on in the aisle. 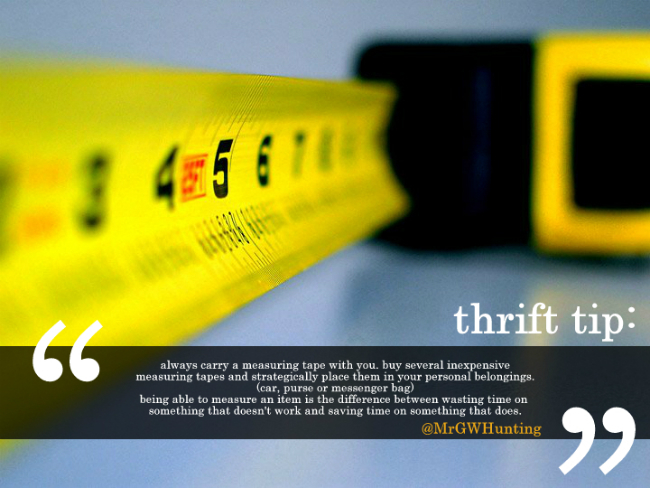 if you are trying to decorate your home, a random measuring tape in your car or bag is essential. the worst thing is to buy an amazing piece at a great price and one it doesn't fit in your car (if you haven't a truck) or two you get it home and it just doesn't fit the space. often there are no refunds on furniture bought from second hand stores. i would add that a brightly colored or a fun measuring tape will help you keep track of it...maybe. so remember having a measuring tape on hand at all times can save you time, and money.